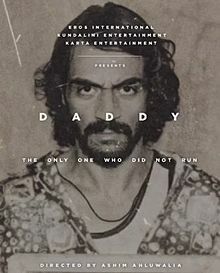 We were earlier intrigued by Arjun Rampal starrer 'Daddy' teaser and now its trailer is out. It is obvious that cine-goers are going to flock to the cinemas on the first day itself because of Arjun Rampal’s perfect gangster looks. He slays it in his own style. The 2 minute 14 sec long trailer is going viral on the internet and it is catchy as anything. The trailer starts with a voice over that chronicles about the shutdown of textile mills in the 1970 Bombay and narrates what subsequently ensued in Dagdli chawl back then. The residents of the society came under the influence of Bombay underworld and hence B.R.A gang was forged. The most dangerous of this lot was Arun Gawli- the real life gangster turned politician who had multiple charges on him. Arjun Rampal is playing this real life character. Donned in white kurta pyjama with the signature Gandhi topi his character is ironic as non-violence is not his forte. We have all seen Arjun Rampal on-screen in his earlier movies like 'Housefull' series, 'Rock On!!' and others. But this look is going to be remembered for long and his new avatar is something we have not seen before. Daddy has been written and directed by Ashim Ahluwalia and produced by Arjun Rampal himself. It is scheduled to release on July 21. It is to be noted here that Arun Gawli was one of the most dangerous gangsters of Bombay in the 70's and 80's era who later became an MLA from Chinchpokli. His arch rival and great enemy was none other than Dawood Ibrahim. This crime political drama thriller is going to attract lot of audience for mainly three reasons- effective portrayal of bygone Bombay, the catchy and intriguing looks of Arjun Rampal and lastly because a real-life gangster turned politician story is in anyways always attractive to the Indian audience. Ashim Ahluwalia had earlier gained recognition for his film 'Miss Lovely' which won a National Film Award. His movies have been screened at many international film festivals.